In order to serve all the special fund raisers doing the Great Yarmouth Sport Relief Golden Mile today, Sara’s Tearooms will be open from 8:30am until 4:30pm. Join us today and watch all the runners completing their 1, 3 or 6 mile run from the comfort of our outdoor dining areas! 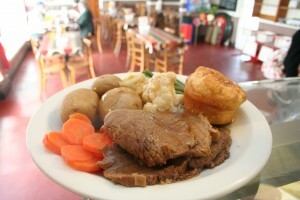 Served with Sara’s Homemade Yorkshire Pudding, New Potatoes, a selection of Fresh Vegetables and a Rich Gravy.